admin on Should the new wood fence be stained? Lydia on Should the new wood fence be stained? kristi on Should the new wood fence be stained? Should the new Wood Fence be Stained? 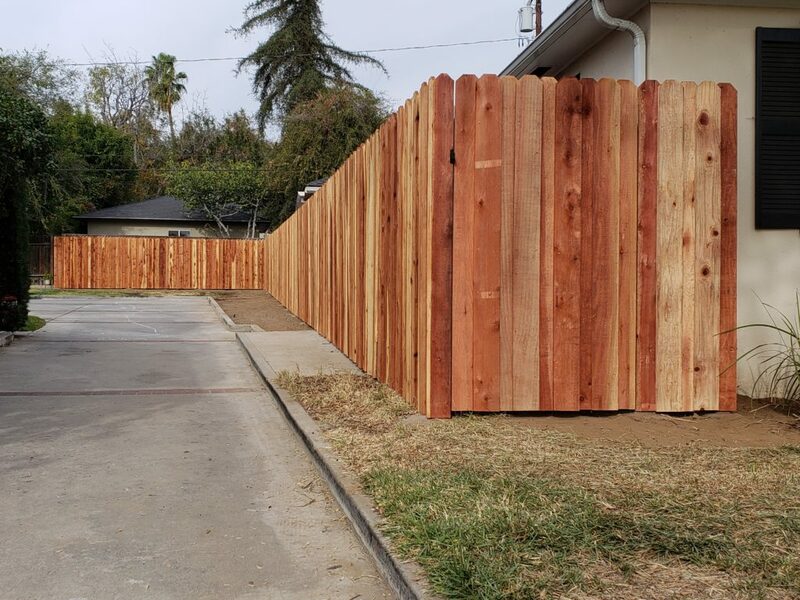 Wood Fence Installation in Los Angeles? Yeppers! 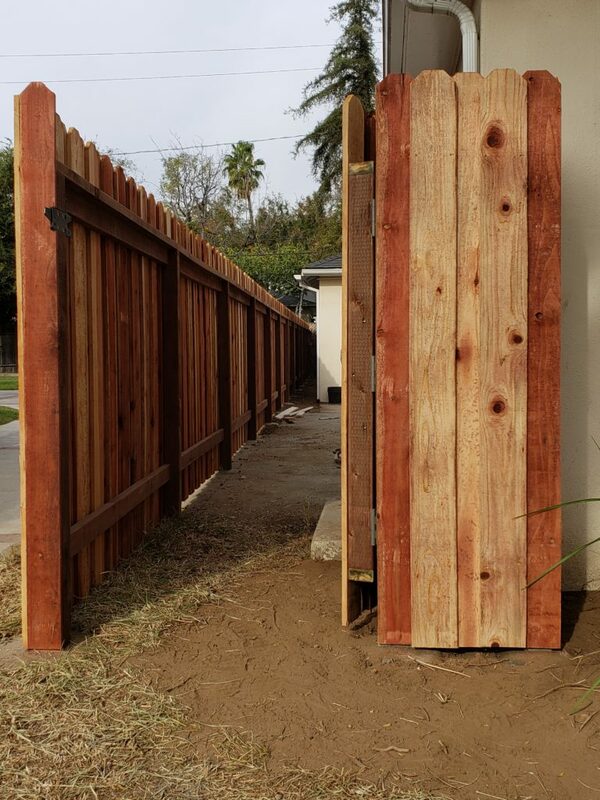 Here’s a look about our latest wood fence project in the Los Angeles area. It came out perfect! It’s a board-on-board style backyard privacy Redwood fence with a heavy duty matching pedestrian gate. The longest span here is shared by, and dividing two neighbors. Plus there’s an adjoining span back there for the neighbor on the left, and another adjoining span up front with a heavy duty matching wood pedestrian gate for the neighbor on the right. There was an old chain link fence from the back corner up to the concrete slab that was full of vines, overgrowth and finally fiberglass panels to hide the mess for the neighbor on the left (which they inherited when they purchased their home). Then adjoining to that was a very poorly built regular dog ear wood fence with an equally poorly-built wood pedestrian gate coming forward upon the concrete slab, that was unsurprisingly out-of-alignment with the adjoining chain link fence to the rear. Also along the chain link fence on the left side were several bushes that they wanted GONE to allow a future new landscaping project. I apologize for not taking photos before we started, I did not think about doing a blog article about this project then. We removed everything undesirable as requested and agreed, we did some minor raking to even out the slope/grade for the new wood fence. And we built this awesome new wood fence and matching wood pedestrian gate project that everybody loved! The neighbors on the right also recently purchased their home so they also inherited the mess of an old fence that they shared with the neighbors on the right. Both neighbors decided to split the cost of the wood fence span that they shared, and that made it even more affordable and more desirable for each of them! Both neighbors were very nice and pleasant, as a matter-of-fact, they were so nice that they probably could have had NO fence and would have been happy. But both neighbors have kids and one has a dog so security and privacy needed to be remedied, hence the build we built. In my absence both neighbors met to discuss and agree upon the exact length and front ending-point of the long span that they shared, as well as the final design of the new wood fence. Originally only the neighbor on the left had contacted me about this project. During our meeting the subject of the neighbor on the right came up as they were doing an extensive remodel project at the time and they also had recently purchased their home. In the second photo above you can see a couple of white painted wood scraps on the ground near our new wood fence from the remodel crew. When they learned the advantages of meeting with the neighbor to work out design details and share the cost of the new wood fence it became obvious that it was a win/win situation for everybody, so they said they’d meet with the neighbor on the right whom they’ve already met to discuss the project! Yes it’s a Redwood privacy wood fence but obviously as you can see the posts and framing are pressure treated Douglas Fir. 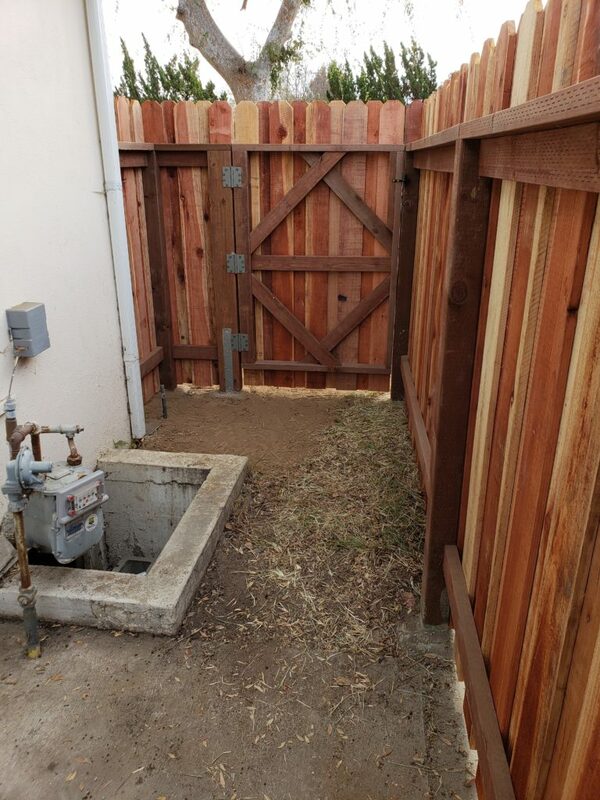 Hopefully the photos are clear enough for you to see the slightly elevated concrete foundations, that are necessary to isolate the posts from soil and moisture to inhibit rot and infestation. Not all wood fence builders know about this or even care, or even inform you about it. Ever wonder why rotten fences usually fail at the base of the posts? Where the posts are surrounded by dirt and usually eaten away by termites, not isolated from the dirt with slightly elevated concrete foundations as we routinely do and as shown here? Sure it’s slightly more expensive, slightly, but it greatly extends the life of the new wood fence! Call, text or email me when you’d like a higher quality new wood fence, wood driveway gate, etc. !